Covidien, a leader in the medical technology and supply industry, has partnered with JB Design in conjunction with the HOPE Program to help fight health risk factors in NFL players both past and present. In collaboration with the NFL HOPE Program Mission and the Living Heart Foundation, Covidien will be relying on JB Design to create an image and multifaceted marketing campaign to resonate with both Covidien employees and potential clients. This new initiative will provide the critical informational structure linking the medical community with those who are in need. The weight management initiative is an extension of the existing Living Heart Foundation programs that are aimed at promoting health services to specific groups that have been traditionally overlooked – including high school, college and professional athletes, as well as underserved populations. 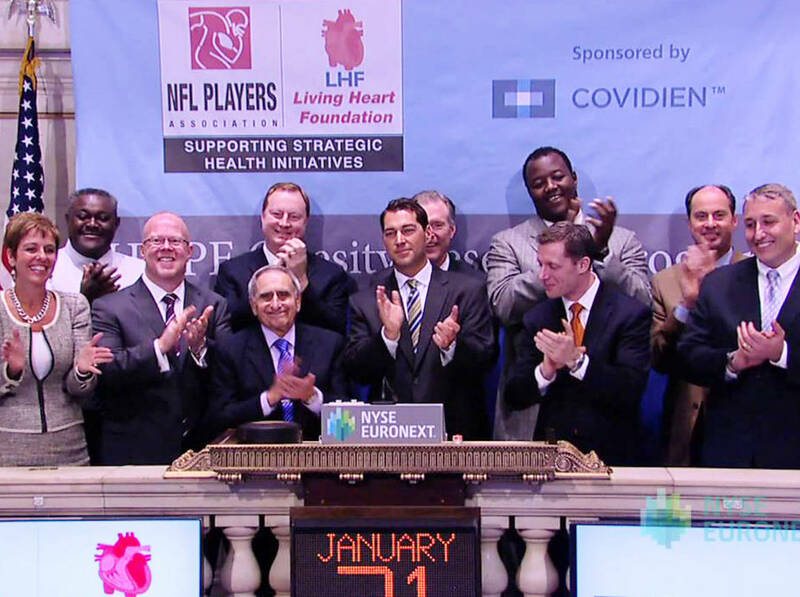 When representatives from Covidien and the NFL Players Association visited the New York Stock Exchange (NYSE) to ring The Opening Bell®, they were wearing jerseys designed by JB Design. The current market is comprised of networks, and consumers are identifying with more than one entity at a time—especially in the realm of healthcare. Through controlled exposure and message scaffolding, we can reach the consumer with information that resonates with them on a higher, more indelible level. Covidien seeks long-term results not only for this outreach effort and their company, but also for the patients that would be embarking on the challenge of rebuilding their health. We are dedicated to helping them remain focused and successful. Branding is the playbook of commerce. And it’s great to be a part of such a positive effort on such a global stage,” says J. Berry.